Clevelanders get DIRECT TV and watch all of your favorite movies! Of all the stuff that's remembered about THE BLUES BROTHERS, perhaps the most important is one least remarked on. Yes, kids, this was the trailblazer, the brave pioneer, the groundbreaking movie milestone…The first feature that was a spinoff of a Saturday Night Live recurring-character sketch. True, without the existence of the somewhat culty 1980 John Landis epic it's still possible that WAYNE'S WORLD, IT'S PAT, MACGRUBER, THE LADIES' MAN, CONEHEADS etc. etc. etc. argh! might have still happened. Never underestimate Lorne Michaels, AKA Dr. Evil. But this one opened the floodgates, for good or ill. Good, I guess, if you're into budget Halloween costumes, because the matching Men-in-Black suits, sunglasses, briefcases, handcuffs etc. now allows most any two whites to become Jake and Elwood, AKA John Belushi and Dan Aykroyd, two extremely Anglo-looking guys who sing blues music (the race switch was the essential joke, I’m told, but Aykroyd has since been an iconic partner in the House of Blues restaurant and music-venue chain and thus puts his money where his schtick is). 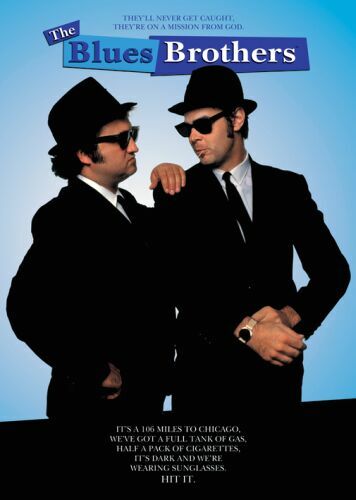 THE BLUES BROTHERS begins with taciturn Elwood picking up taciturn brother Jake from finishing his prison term in Joliet and visiting the Chicago Catholic orphanage where they grew up. There the head nun (who still hits them with a ruler when they swear) tells them that the school will close unless they raise the lordly sum of $5,000 (excuse me while I sob). Jake and Elwood decide to do this "mission from God" by coordinating a big blues-music fundraiser concert. But standing arbitrarily in their way, for no other reason than to make some plot mayhem happen, in a conspiracy of Illinois Nazis (yes, Nazis) led by Henry Gibson, of Laugh-In fame. This leads to giant car chases and crashes – lots of giant car chases and crashes, mostly involving Chicago police vehicles. The Blues Brothers’ car of choice, is in fact, a surplus police car with, as Elwood brags, “cop pickup, cop brakes, cop suspension”…I myself later bought an ex-police Crown Victoria at auction and nobody makes movies about me. Damn Hollywood. What does an epochal Chicago blues concert have to do with crashing autos, in some of the biggest vehicular stunt scenes ever conceived? Who knows? Director Landis had just come off of NATIONAL LAMPOON’S ANIMAL HOUSE and was having tons of money thrown at him, Belushi and Aykroyd were comedy messiahs coming out of late night, were having tons of money thrown at them, etc. Nobody’s whim or vice was too small to be indulged by Universal Pictures Let's just say there was lots of...chemistry on the set (for more information, read Bob Woodward's infamous Belushi biography Wired, only be prepared to get squirmingly embarrassed about a whole lotta star drug-fiend names dropped, and don't expect Dan Aykroyd to be especially pleased with your taste in literature). Oh sure, there are great bits of entertainment here in the picture, concert bits by Cab Calloway, Ray Charles, James Brown and Aretha Franklin. Belushi and Ayckroyd do some nice numbers themselves, highlight for me being their non-blues cover of "Rawhide" they belt out (apparently endlessly) to entertain blues-hating rednecks in a C&W bar. John Candy has a fine scene-stealing role as the BB's "nemesis," a jolly Chicago cop who just seems to get happier and happier the more often the brothers escape from him. Watch for the cameo by Steven Spielberg as a city bureaucrat.